The quantum jump occurs on December 13, and corresponds to the epic ice storm on December 11/12. The storm temporarily knocked the majority of New Hampshire’s homes and businesses off the power grid, and for many the outage lasted days or even weeks. @psnh How about an online map showing the areas without power? We could see the progress of the crews as the power is restored. @garylerude Good idea – working on it! @psnh Incidentally if you need help publishing your data online and creating maps, lots of us here are good at that and happy to help. @judell Yes, ur google map screencast of Keene walking tour comes to mind. We may follow up on ur offer! Whoa. This is definitely not how your grandfather’s utility company handles public relations! In this interview we discuss Martin’s use of social media in the wake of the storm. Of course he has been interviewed elsewhere and more prominently on that subject. So I also asked Martin to reflect on how business-as-usual may change going forward. Of special interest to me is the portion of that chart beyond Dec 13. True, the follower count has plateaued. 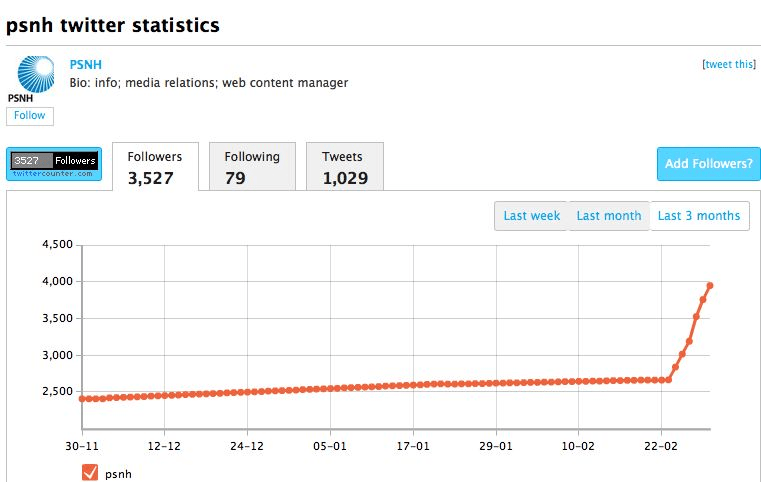 But it hasn’t plummeted, and won’t, because it costs followers nothing to stay tuned in to a quiescent channel. If PSNH uses that channel judiciously from now on, I’ll stay tuned in. If the channel annoys me, I can silence it. That’s analogous to unsubscribing from an email newsletter, but better from my perspective because the unsubscribe mechanism is obvious, uniform, immediately effective, and fully under my control. How will PSNH use this channel for normal, non-crisis operations? Martin thinks that customer service with a human voice is the way forward, and I violently agree. That’s what customer service used to be and — let’s hope — will be again. 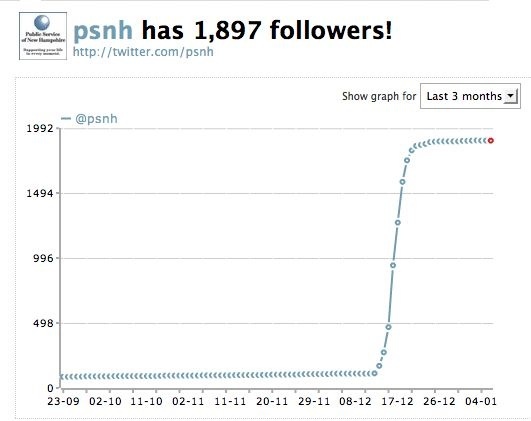 In Dec 2008, @psnh went from zero to almost 2000 followers as a result of an epic ice storm. A year later the count had crept up to 2600. Then 2010’s epic wind storm spiked it to 4000. To put these seemingly dramatic numbers in context, though, both storms created outages for more than half the company’s customers. New Hampshire is a small state, with population of only 1.3 million, but even so these storms affected on the order of half a million people. Yet even now @psnh is reaching fewer than one percent of them. Whilst I agree that Twitter can be a great way to disseminate information, I think there’s a danger that the “flavour of the month” will be used for purposes that are much better served by IM, forums, email, etc. That said, customer service from utility companies and governments definitely needs improving (in Australia at least), altho I’m not sure they will ever truly embrace Web 2.0 concepts due to the possibilities for negative customer feedback published on their site..
Agree. One of the points made in the interview is that the breakthrough isn’t Twitter per se, but rather a one-to-many, pub/sub communication pattern of which Twitter is only one convenient form. Conventional blogging is another, and I argue that had this ice storm occurred 3 years ago this same story would have played out there instead. The pattern — the architecture of one-to-many communication — that’s the thing. Your mode of explaining everything in this article is really good, every one be capable of easily know it, Thanks a lot.